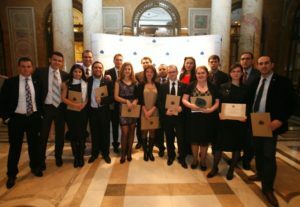 Our first Aspen Leadership Awards Gala, on December 5, overlapped with the celebration of five years of operations at the Aspen Institute Romania. We have come a long way from the enthusiastic but also challenging beginnings. We kept the promise of the auspicious start. Today, as for the past five years, our agenda is comprehensive and our work important. We were joined by many of those that were instrumental in our creation and successes and those that benefited of our programs and fellowships. This was an occasion to reflect on what is the added value of an institution rooted in the culture of dialogue, of a community moved by shared values and not just interests. We also hosted a conversation with Aspen founding members and Aspen Fellows moderated by Aspen US Seminars Director, Dr. Todd Breyfogle. On the same occasion, the Aspen Institute acknowledged 3 leaders of the Romanian society that have had a significant contribution to the overall advancement of Romanian society. Via the Aspen Leadership Awards we aim to highlight specific efforts and personal commitment to values based activity and celebrates creative, transformative leadership. This prominent figure of Romania’s 20 past years has excelled in his field of activity, by constantly supporting and promoting national values and creating an institution which offers the feeling of balance, security and long term vision for the Romanian society. Under MugurIsarescu’s stewardship the National Bank has turned again into a promoter of Romania’s cultural values. All in all the Aspen Institute Board and its membership believe this is a concrete and continued contribution to the Good Society. For all of the above, on behalf of the Aspen Network of International Partners, we are very pleased to confer to Mr. Mugur Isarescu the award for values-based leadership. A former military parachutist, and one of the few Romanian graduates of the “US Army Ranger School”, Mr. Serban is viewed as a Romanian hero, being awarded, in 2011, the “Discovery Hero” award. In June 2006, Mr. Serban, who was a mission in Afghanistan, was trying to save some colleagues from an armoured personnel carrier, when he stepped on a mine. This accident left him without his right leg. However, Mr. Serban proved that he can overcome the effects of his accident, by continuing to serve in the army, and to practice his hobbies, flying with the paragliding and using a motorcycle. Mr. Serban founded the “CamaraziiArmateiRomane” Association, whose actions are directed towards those militaries who have suffered injuries during an operation, as well as the survivors of those deceased in combat. As Mr. Serban was hospitalized on December 5, his girlfriend, Ms. Anca Gradinaru received the award on his behalf. This recognition is awarded to a number of projects and people which brought significant contributions to the Romanian educational environment, transforming young people into active citizens capable of civic engagement. The organization which Ms. Certan is running with her colleagues created the largest youth community service learning movement in Romania and has exported its learning model to countries like the US, Honduras or the Republic of Moldova. This is but one of the reasons why Aspen Romania chose Ms. Certan to receive this award on behalf of several education organizations connected with our Institute, among which: Aspire Academy, Policy Center for Roma and Minorities, LideriiMileniuluiTrei, LeaderSHE, Empowering Roma Women, Danube-Black Sea YOUth Network, Roma Education Fund, European Olympics, YoungEntrepreneurs, The Romanian Debate Association, Ratiu Centre for Democracy, Open Society Institute, Oricum Foundation, Leaders Romania, Succes in Romania or Leaders for Justice. They all deserve our appreciation. We chose Diana as a symbol of the power of grassroots. As a sign of times to come. For the sea of change that young Romanians will unleash in this country and Europe if they’re given an opportunity.